The Norway Flag is red and features an indigo Scandinavian cross with a white border that reaches to the edges of the flag. The vertical part of the cross is not positioned in the center of the flag but more towards the left side of it. The red, white, and blue colors were influenced from the French flag (French Tricolour) and they are a symbol of freedom and liberty. 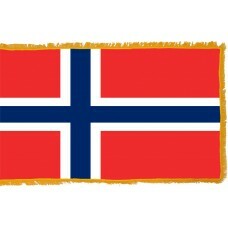 The red and white colors represent Norway's union with Denmark and the blue color represents Norway's union with Sweden. The blue cross is Scandinavian and it represents Christianity. 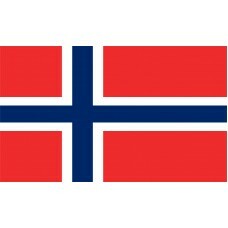 The Norway Flag was adopted on July 17th, 1821, while Norway was still in a union with Sweden. Norway (which is officially known as "Kongeriket Norge" – Kingdom of Norway) is a Scandinavian country that is located in Northern Europe and shares borders with Russia, Finland, Sweden, and the North Sea. Its capital city and largest city is called Oslo. It is a country that features so much beautiful scenery and landscapes and is home to some of the largest fjords, which include, "Sognefjorden" which is the largest fjord in Norway and the 3rd largest Fjord in the world. It is a country that is very popular for skiing during the winter months and the majority of tourists that visit in the summer are mainly visiting to see the Northern Lights (Aurora Borealis). The early 14th Century was considered to be Norway's Golden Age due to the increase in trading with other countries and the peace within the country. In 1349, however, the bubonic plague (black death) invaded Norway, killing a third of its population. This had a huge effect on the country, wiping out some communities and reducing the country's economy as well as weakening the King's position due to the reduction in tax income. As a result, in 1380, Olaf Haakonsson acquired both the Norway throne as well as the Denmark throne and created the union between Denmark and Norway, which caused many conflicts and battles. In 1397, the Kalmar union was formed between Norway, Denmark, and Sweden. Norway was the weaker nation and played a minor role until Sweden declared its independence from the union in 1520, resulting in the formation of the Denmark-Norway nation. During the 17th Century, Sweden and Denmark were warring, but Norway's economy continued to prosper due to the timber trade and in 1813, the movement for Norwegian independence began. On May 17th, 1814, a constitution was formed in Norway and May 17th is celebrated every year as "Norwegian Constitution Day." A few weeks after the constitution, Sweden invaded Norway and Norway had to agree to Swedish rule which existed until Norway gained independence in 1905. As a result of the Swedish rule, many Norwegians decided to emigrate and by 1930, approximately 800,000 people had left the country. Those who gave us birth. Brings as dreams to earth. Till we gained our right. Armed to guard her peace.